Of exceptionally good workmanship, correct measurements in the model and graduation of top and back. Well seasoned selected wood is used. Handvarnished and polished. Fine trimmings. Flamed wood and choice spruce top, fine reddish‑brown shading. Nicely figured two-piece back, good quality spruce top, golden‑brown shaded and imitated. Better flamed back, seasoned spruce top, reddish‑brown shading. Selected old maple, finely figured, choice spruce top, fine orange‑brown shading. 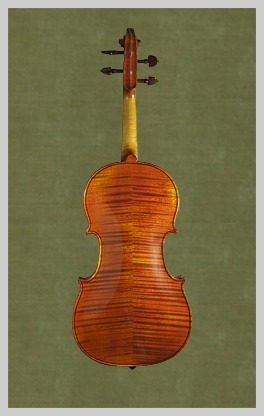 Guarnerius-model, well framed wood for back, sides and neck, golden‑redbrown shaded, slightly imitated.